Maya Calendar, Calendar, maya art, maya, precolumbian reproductions, mesoamerican reproductions, mayan art, arte maya. The Maya Calendar depicted here was called "the Haab", the Maya solar calendar of 365 days. It was divided into 18 months of 20 days each with a period of 5 days left over at the end of the year. This short 5 day month is called Uayeb, "the resting or sleep of the year". 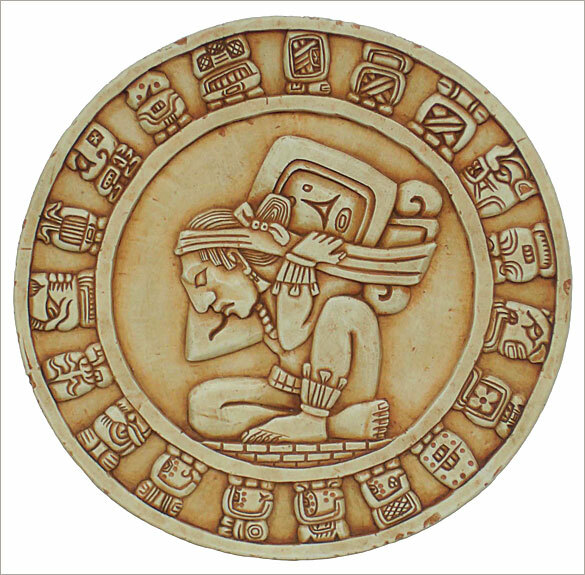 The Maya also used another calendar of 260 days called the sacred round or Tzolkin composed of 13 months of 20 days. A cycle of 52 solar years, called the calendar round was also used. The calendar round of 52 years included both the Haab and Tzolkin calendars intermeshing with each other. Any specific day in the 260 day calendar had a unique corresponding position in the 360 day calendar but that corresponding position would not repeat itself again for 52 solar years. This calendar sculpture shows the Maya God of Time at the center, supporting the burden of time on his back. He is surrounded by the hieroglyphs of the 19 months.